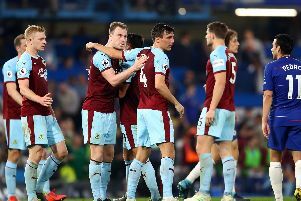 Despite scoring less goals than the top Premier League strikers, Burnley’s rising star Danny Ings has been on the radar of top Premier League clubs. And it is clear to see why. Ings has played 26 matches this season, scoring nine goals. Last season, the Championship Player of the Year netted 21 goals in 40 appearances. This graph suggests he has continued his fine form. After a tough start and missing four matches due to a hamstring injury, he scored his first Premier League goal at home to Everton, before a brace at Stoke City. He has since found the net five times in his last 10 appearances. Despite the fact that he is only the 13th top scorer in the English top flight, a detailed comparison with the top three by Opta­powered fantasy football game Oulala.com reveal much more about him as a player. Chelsea star Diego Costa is the only member of a trio who has had fewer shots than Ings this season, while Manchester City’s Sergio Agüero leads the way in terms of assists. The 22- year- old Ings has played an important role defensively and with 23 tackles won, he massively outranks the top three. He has also shown more effort regards to intercepting the ball. It is also worth mentioning he has been fouled almost as many times as Agüero and Costa combined.